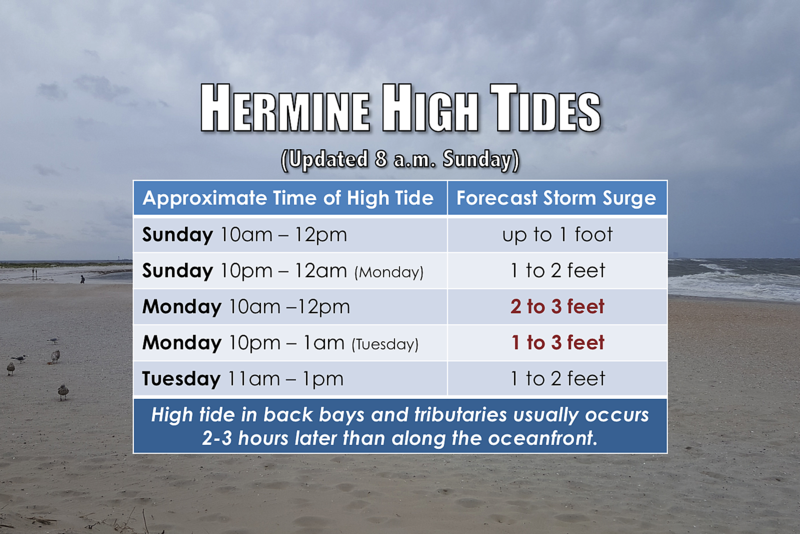 There are improvements to the Hermine forecast. But with a hurricane-strength storm just 200 miles off the Jersey Shore, near-record coastal flooding remains probable. What a pleasant surprise to step outside this morning to walk the dog and find breaks of sunshine and light winds?! Then I panicked a bit - what happened to our hurricane? Post-tropical cyclone Hermine is still moving east-northeast as of 8 a.m. Sunday, carrying it further away from the East Coast. Originally, we were thinking the center could come within 100 miles of the Jersey Shore. The latest forecast keeps the center at least 200 miles away from NJ. That is good news. The shift eastward does mean we can decrease the chance for 3+ inch rain bands to almost zero. This was always our biggest "question mark" regarding the Hermine forecast, and we've trended far from a worst-case scenario. While some rain may still drift over the Garden State, mainly on Monday, totals will be quite low. The shift has also significantly decreased our cloud cover - Sunday may ultimately stay pretty pleasant, especially the further north and west in New Jersey you go. Such a shift also means we can decrease our wind forecast. Expect winds to increase late Sunday through Monday, sustained at 20 to 30 mph, with gusts to 40 mph inland and 50 mph along the coast. Only slightly stronger than on Saturday. It is enough of a decrease to reduce our power outage forecast from "scattered" to "sporadic." But we always knew that the rain and wind would not be the primary threats from Hermine. How does the storm surge/coastal flooding picture look? Slightly better, but still dicey. Hermine is expected to continuing spinning slowly just off New Jersey's coastline through Wednesday. And, fueled by a very warm ocean, the storm will intensify slightly to hurricane strength (75+ mph max sustained winds). That still puts the Jersey Shore in a precarious situation, as the storm will still push a lot of water toward the coast. Max storm surge will fall in the 1 to 3 feet range. Previous forecasts suggested 4 or 5 foot surge would be possible, but that no longer seems to be the case. The timing of the most precarious high tide cycles has also shifted later - it is now Monday morning and Monday evening when we'll be holding our collective breath. Severe beach erosion is already underway along the Jersey Shore, as the coast has been battered by Hermine's waves. 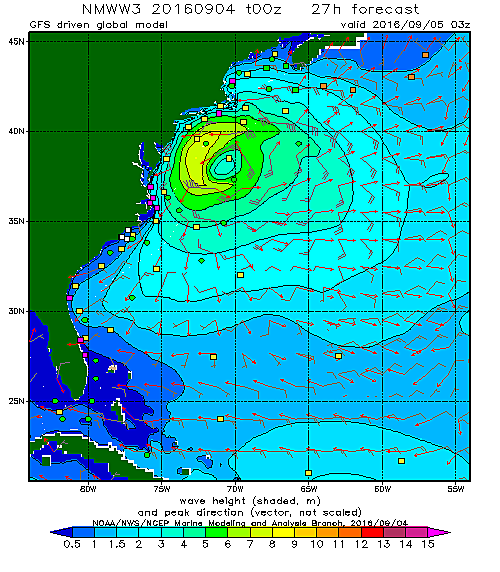 10+ breaking waves will continue, with 25 foot waves forecast further out in the Atlantic. While record flooding seems to be off the table, near-record flooding remains possible along the south coast. Cape May's crest at 8.85 feet on Monday morning would now rank as the 3rd highest water level (behind the January blizzard and Sandy). Atlantic City's Monday evening peak of 8.10 feet falls outside the top 5 crests on-record, but is still in the "major flooding" category. So, Sunday night into Monday will be the peak of the storm. The waves and the surge will gradually subside on Tuesday. By Wednesday we should fall out of the influence of Hermine as the storm departs for the open ocean. Even though the forecast is not quite as ominous as it was previous, please don't become complacent, especially if you live along the Jersey Shore. Even though record flooding is no longer forecast, moderate to major flooding is enough to inundate roads, low-lying areas, and homes. Could the Hermine situation continue to improve? Absolutely. Continue to prepare for the worst, and hope for the best. And we'll continue to keep you updated.